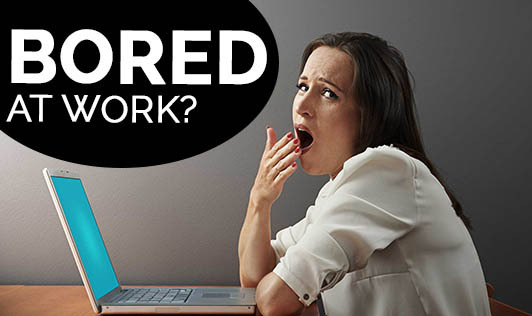 Is boredom pulling down your productivity @ work? Boredom in office is a challenge for anyone to defeat, but it`s your right to have fun at work. Sometimes, when you are bored, you may just feel like eating something that is a strict "no" if you are watching your weight. But if that`s the only choice to boost your mood, then go for a small piece of chocolate or a cup of coffee or a small scoop of ice cream. But remember to keep it in moderation! Read out jokes and laugh out loud: That`s the age old trick, but it`s worth being copied. With the internet at hand 24/7, you don`t have to hide those joke books in your cabin anymore. Just GOOGLE a handful of jokes that could wake your sleepy colleague up in a fit. Munch on a healthy snack: We are not talking about chips, samosas, namkeens and other fattening foods, but a healthy snack that can keep your mind alert and your body in shape. Choose from a variety of foods like cut fruits, Juice, oat biscuits, Dry fruits, dhokla etc. Walk: Get up from your seat and walk for 5 minutes or just visit your neighbor`s work station for a chit chat or just to get a cup of coffee or green tea. Listen to music: Everyone has a computer and a pair of earphones. So pick your choice of music depending on your mood and you could even add a few steps to it! Play Sudoku/Solve a puzzle: Internet is your savior again! Work can get stressful and monotonous. Try your hand at a game of Sudoku or a crossword that will help you get your mind off work for a while. It can be of great help and can be refreshing too! Interact with your colleagues: Talk to your colleagues about their work, share ideas, thoughts, jokes or any piece of information you can think of! Boredom is just phase that all of us go through at some point. There are several ways to get over it. Try these simple ideas to break it!